The tiny triangular land of Goa in India, nestled on the west coast of India is synonymous with its pristine beaches, Portuguese influence and architecture and rich cultural milieu. With its coastline spanning 125 km, it is little wonder that Goa holidays have come to mean lazing around the scenic beaches at Colva, Calangute, Palolem, Anjuna, Baga and Miramar. 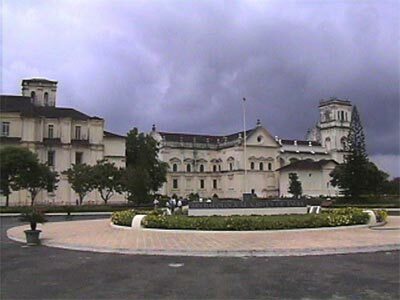 The important cities of Goa, India are Marmagoa, Margao and Panjim (Panaji). A flight to Goa or a train journey through the picturesque Western Ghats will take you to this small state. Read on to find interesting information on Goa, its tourist spots, resorts and special cuisine. You can take a flight to Goa from Bombay, Bangalore, Cochin, Delhi, Pune and Thiruvananthapuram. If you take a flight to Goa, the Dabolim airport is about 30 km away from the capital. You can take a coach service that is provided for inbound and outbound flights. There is no dearth of private cars and taxis. If you are planning a trip to Goa, you can take the new Konkan Railways, which is well connected with Mumbai, Bangalore, Delhi, Mysore, Pune and Hyderabad. You can alight at Vasco or Margao stations. The Konkan Railways has made it easier to travel to Goa. 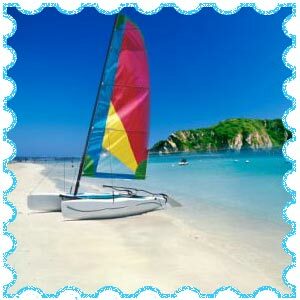 Another alternative is to enjoy a catamaran ride from Mumbai. A road trip to Goa is also possible. Comfortable buses ply to Goa from Bangalore, Mangalore and Pune. Since it is located in the coastal Konkan region of western India, the weather of Goa is generally warm and sunny. The average Goan temperatures range between 25 and 30 degree C. The monsoons lash Goa between June and September. Goa receives nearly 325 cms of rainfall annually. Goa weather is generally sunny, with clear skies. Ideal weather in Goa is from October to February. A trip to Goa should be planned around this period, so that you can escape the torrential rains as well as the humidity. Tourism is vital to Goa's economy. Every year, millions of tourists throng the beaches of Goa from the rest of the India and across the world. But Goa is not just about beaches. 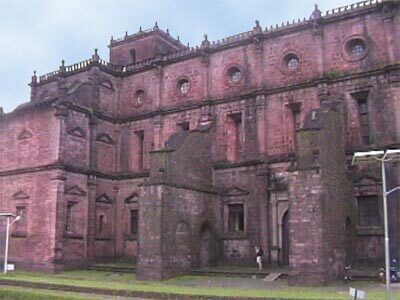 The churches and temples of Goa dating back many centuries are part of Goa's old-world charm. Portuguese architecture can be seen in the famous Church of Bom Jesus, which is a laterite structure with a three storeyed façade. The Church is dedicated to Bom Jesus, which means Infant Jesus. This Church was consecrated on 15 May 1594 by Fr. Alexia de Menezes. The Bom Jesus Basilica preserves the embalmed body of St. Francis Xavier. The Cathedral at Old Goa is perhaps the largest church in Asia. This 16th century monument has 14 side chapels and boasts of the huge Golden bell, which is the biggest in the world. The Se cathedral is dedicated to St. Catherine and was the location where the sacred relics of St. Francis Xavier were displayed to the public. This church is built in the Tuscan style. The Cross of Miracles is believed to be growing in size and is said to have healing properties. The Church of St. Francis of Assisi stands next to the Se Cathedral. 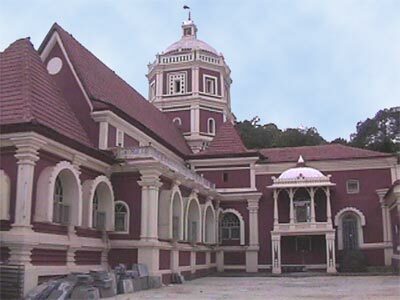 This laterite structure is now part of the archaeological museum. The Church of St. Francis of Assisi in Old Goa is adorned with exquisite paintings and carvings. 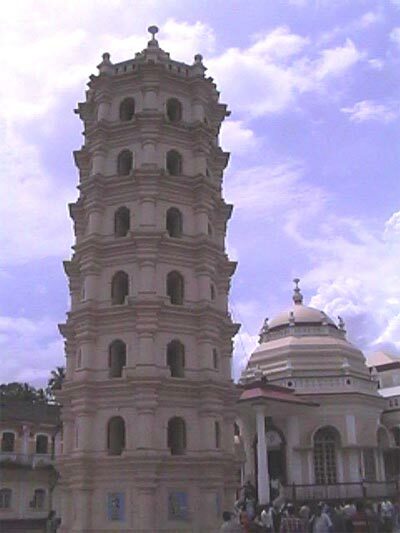 The architecture of the Saraswat temples in Goa is different from many other Hindu temples due to historical reasons. The presence of a Lamp Tower or 'Deep Stambha' is characteristic of these temples. The Mangeshi temple in Ponda is a small temple dedicated to Lord Shiva. The Shantadurga temple in Kavlem has the tranquil image of Goddess Durga. The Devaki Krishna temple in Marchel has the beautiful statue of baby Krishna on his mother's hip. This idol is made of black stone and is unusual in its representation of Krishna as a baby. People worship Lord Vishnu in a female form at the Mahalasa Narayani temple in Mardol. This temple has exquisitely carved pillars and a lamp tower that is probably one of the biggest in Goa. Another popular Goa tourism attraction is the famous carnival. The annual carnival of Goa is a Latin inspired extravaganza, reminiscent of ancient Roman and Grecian ritual feasts. The streets of Goa are agog with colorful parades, floats, balls and bands during the three days and nights of February. 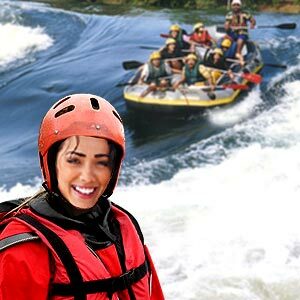 Tourists on a Goan holiday can enjoy themselves at the Dudhsagar and Aravalem waterfalls. Dona Paula, which overlooks Marmagoa offers a wonderful view of the Goan rivers meeting the Arabian Sea. This place has now become a commercialized resort offering facilities for water scootering and water sports on account of its lake-like conditions that make it the perfect setting for beginners and learners alike. 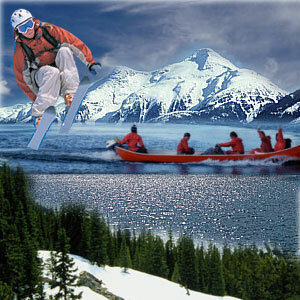 You can also indulge in windsurfing, parasailing, water skiing, snorkeling, harpoon fishing and yachting here. The annual water sports festival is hosted every November at Dona Paula. The Marine Biology Museum and Taxonomy Reference center of the institute is yet another tourist haunt at Dona Paula. If you want to take back a souvenir of this serene land, you have a lot to choose from. You can find brassware and terracotta work aplenty. Bamboo work and papier mache are also very popular here. Don't leave Goa without carrying a packet of cashew nuts, be it the plain or salted variety. A Goa holiday is ideal for swimmers, beach buffs, sunbathers, water sports enthusiasts and tourists alike. Take a cruise on the Mandovi river ferry. The beaches of Goa beckon all those who want all the sand and surf on their Goan vacation. The Calangute beach, about 16 km from Panjim is the popular holiday resort. The Anjuna Beach and its flea market are popular with many tourists. If you are seeking a relatively pristine beach that offers seclusion, then the beach at Betul is just what you need. The beach at Colva tucked ways in the Salcete area is yet another of Goa's treasured spots. The Palolem Beach or Paradise Beach at South Goa is calm and idyllic. Goa has a thriving economy, fueled in no small way by expatriate Goans who are working in Europe, the U.S and the Gulf states. The population of Goa is about 13,43,998, according to the Census of 2001. Though the official language is Konkani, English, Hindi and Portuguese are also spoken. You can try out typical Goan delicacies at a Goa hotel. Seafood such as prawns, lobsters, crabs and jumbo pomfrets are used in plenty in soups, salads and pickles. Fish curry and rice is the staple diet of Goans. If you are a lover of seafood, you can gorge on the king fish, mackerels, sardines, squid and mussels and oysters. Some Goan delicacies are Chicken Xacutti, Pork Vindaloo, Sarpatel, Reichado and Balchao. A layered sweet with eggs and coconut milk, Bebinca is yet another Goan delicacy. Coconuts, chillies and tamarind are essential in most Goan dishes. An alternative to tamarind is 'kokum' - a sour deep red colored fruit that lends a sharp and sour taste. Goans also use a toddy-based vinegar to their dishes. A Goa holiday is not complete without sampling the Chourico red sausages at a local Goa hotel. The local drink is 'Feni' - made from the cashew fruit or coconut. Cashew feni is drunk after the first distillation. But you can also find its double-distilled version, flavored with ginger, cumin or sasparilla. When staying in Goa, you can opt for budget or economy hotels or top of the line beach resorts. Sylvan settings, well appointed rooms and cottages, health centers and spas - luxury resorts in Goa are made of these. The luxury resorts in Goa at the Sinquerim Beach offer guests a totally relaxed holiday in Goa. The stretch from Bogmalo in South Goa has a string of luxury resorts that boast of swimming pools, golf courses, ayurveda treatments and sports activities. The Majorda beach is yet another spot for a luxurious beach resort in Goa. The Portuguese influence can be seen in various facets of Goan life, be it the architecture or the cuisine. It is little wonder that Goa is referred to as the 'Rome of the East' or 'Pearl of the Orient'. First Published Date: Aug 13 2005 Last modified Date: April 25 2019 This page may have been updated recently as new information is available or the content may have been edited for better readability.